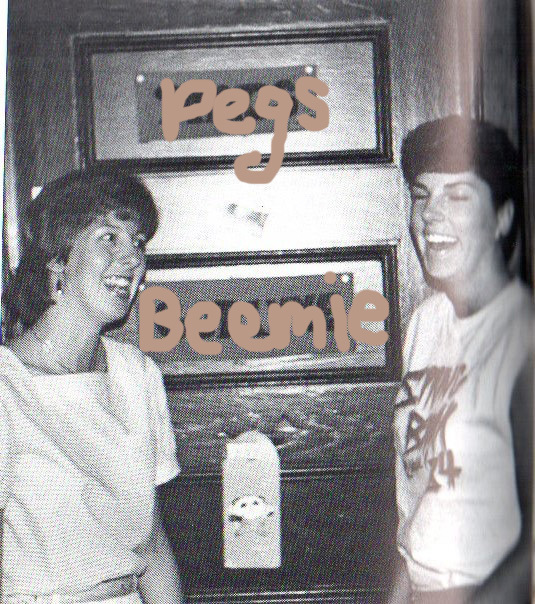 Peggy Anne and I met in April of 1981…we were introduced by the college basketball coach and have been friends ever since. 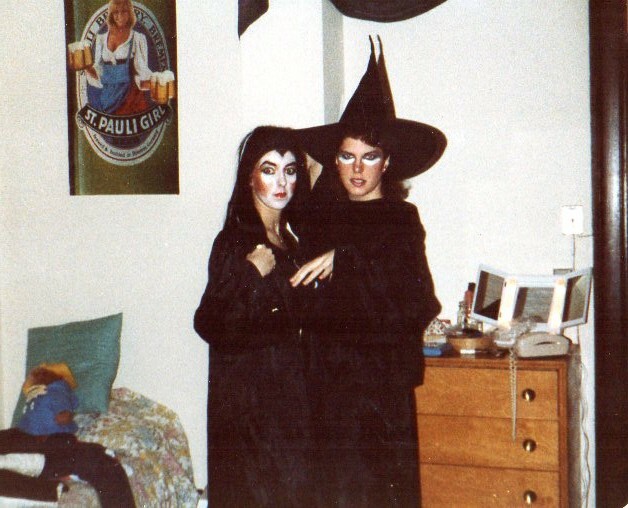 We moved into our dorm room in late August, 1981. She dragged me to a mixer at Towson University four days later and that is where I met the Hubster. I am three months older and she will admit I have always been the wiser and the one who put safety first…you’re welcome. 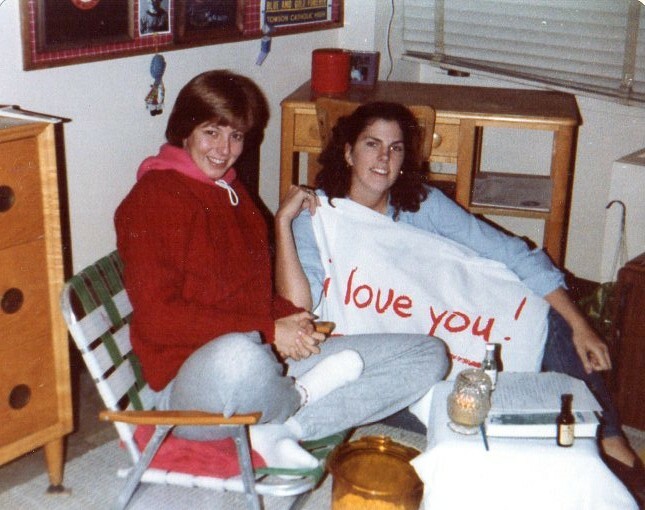 Our freshman dorm room…for the record the drinking age in Maryland was 18. 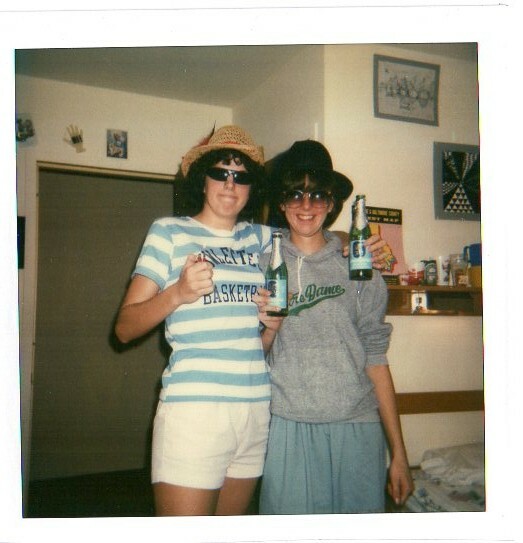 See what I mean about safety first…protective eye wear and the photo of John Paul II above the door. I didn’t want us taking any chances. 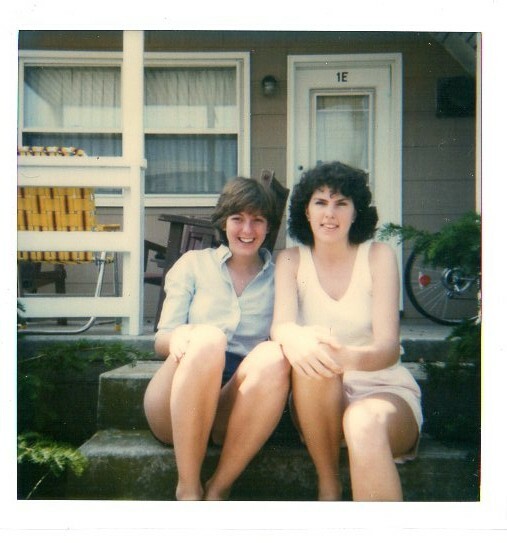 I was headed back to Boston and she was residing and working in OC for the summer…good grief we were pale and thin. I don’t want to brag, but someone had a book and it looks like there were notes….I think we were actually studying. Not sure who brought the miniatures, but obviously for medicinal purposes only. We did have great costumes for Sing-Song. Sing-Song was a “friendly” musical competition among the four classes to keep idle Catholic women out of trouble during Lent. Do you remember philosophy class?…Trying desperately to stay awake. 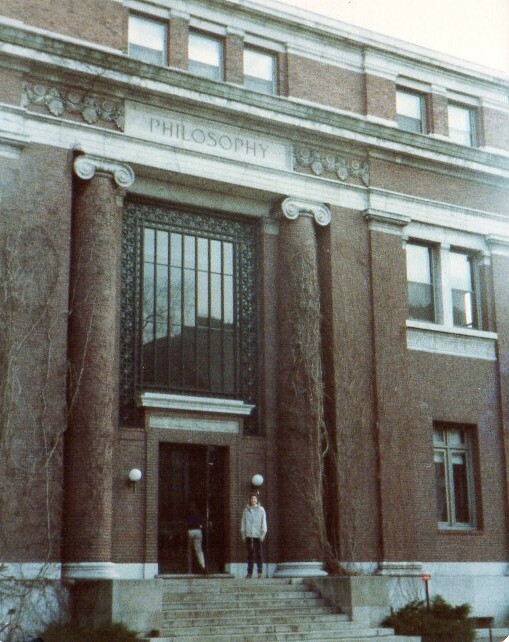 This is you…but not in front of our philosophy building which also was the education, business and religious education building…this was the big time…when we were considering our transfer to Harvard. Once again keeping Catholic women out of trouble during Lent. You survived Spring Break without me…. Look we made the yearbook. Our college has since changed its name to one carefully chosen with university in the name and a much better choice given the acronym for the old name….C.O.N.D.O.M….. I still have plenty of photos for the next 39 years, but most remain in the vault. Your parents are still with us. Hubster says Happy Birthday to you, his favorite third wheel. This entry was posted in At Home, Uncategorized and tagged 39 again, birthday. First of all, I think they should bring back the acronym!!! You two should form an alum group to Bring Back the name! Absolutely priceless. Aren’t old friends just the best! Indeed…old friend who are young at heart. We keep the acronym close to our hearts…it used to make the nuns cringe. 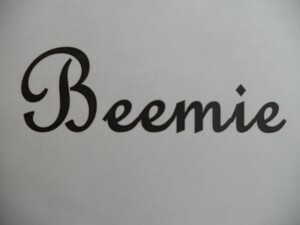 I don’t know that I could recieve a better birthday gift. I have shared this with family and friends, as it is definitely share-worthy. Thank you for the wonderful memories and great story. Glad you enjoyed it…Hope you had a great day with your boys…we will see each other soon. Nothing like good friends…..they complete life! Wow…you speak the truth …when we get together it is like we never left each other’s side.